„Physical Studies“ imparts the participants an additional qualification in physical theatre. During the training they are working on competences in corporeal mime, classical pantomime, improvisation, composition, neutral and character mask. The extra qualification „Physical Studies“ is intended for those who wish to intensively cultivate their skills in physical theatre, improve their experience in physical play, body language, presence, mime and mask play. 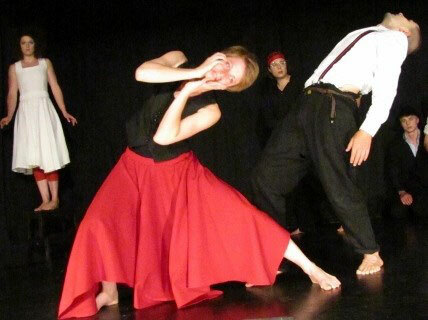 There are teaching Nicoletta Dahlke and other lecturers of the teaching team of the MimeCenter Cologne. Lessons are conducted in German and English! The costs of the extra qualification are 1.735,- €. In addition to 50,- € registration fee. The total costs of 1.785 € are payable in a prepayment of 250 € with registration and by monthly instalment of 11 x 135 € (October 2018 – August 2019). Upon payment of the total costs until 1st of October 2018 we do give 7,5% discount. MimeCenter Office, Wachtelweg 1c, 50829 Köln, Germany. If there are any questions left, please don´t hesitate to contact us!